Doug died very recently; this contribution is more sad news for cactophiles in the Bedford area. The Kempston Show ran for 41 years and now faces closure due to the fact that there are no younger committee members to take it on. The saddest loss is that of 20 to 30 cactus and succulent classes which have been held at the Show since 1977. In that Jubilee Year the local Branch held a Cactus Show at the Corn Exchange in Bedford, which was a financial disaster. Later that year we were invited to the Addison Centre where we could choose our own classes and Society silver spoons were provided for us by the Flower Show. For the next 35 years our classes were always supported and provided much interest for visitors all down the centre of the hall. Our first judge was Charlie Feetham who arrived with a buttonhole of species Pelargonium. Later, Jimmy Machen judged the plants for a number of years, and eventually Owen Skinner obliged. The Show had to be an open one, but it was generally run on Society principles. Later on, and until the end, gave cash prizes of £1, 50p and 30p each class. Well known exhibitors at the Show were Tony Parker, Nick Thompson, and for several years Keith Grantham delighted us with some of his rare and unusual caudiciform succulents. Tony also ran a sales table and with his cheaper prices, always did well. After Tony retired we ran the sales table for Branch funds for which our only other income was the Branch raffle on meeting nights. Until this year we imported cactus plants from the Czech Republic which sold at the pre war price of 65p and rooted succulents went at the grand price of 50 pence a go. After the Branch closure we continued on and gave plant sales to the Addison Centre Charity. Vivi organised the Raffle for many years, donating the first prize of a large box of groceries. Ironically on closing day she won the first prize. Over the years, a few problems arose, which will be of interest here. In the early days we had bright sparks on our committee who insisted on having several classes which included multiple entries. The worst two were three Neoporterias, and a seed box 12” x 7” containing 12 or more plants in small pots. Often an entry included some repotting, which was just a bit too much to do on Show day, so eventually we abandoned multiple entry classes and solved this problem. We also had problems with pot sizes when metric measurements came into general use. There were problems with what kind of tolerance we or the judge would allow in these classes. So eventually we removed all pot sizes from the schedule. Problem solved. Towards our last days we became short of exhibitors so decided to allow two entries per person per class which successfully filled the tables up for the visitors to see. So, after 35 years there will be no cactus plants at Kempston for all to see, and no sales table, which always had plenty of regular customers, to which the late Eric Arnold gave excellent advice. Ed; That’s bad news. This Show was well supported by local people, (and the cacti classes were pretty good too. I always enjoyed Doug’s sales plants and now these are no more as well. They were priced to sell: succulents just 50p and cacti were 80p. Doug certainly spread a lot of plants around the Bedford area and maybe to some potential collectors too. I hope the Show might be resurrected in the future. I could not get to the National Show last August and consequently I was set a task to make up for that omission. I was presented with two 80mm pots of Lithops seedlings purchased for the Branch sales and I was told that they were ‘ready for pricking out’. They were pot thick, though looking very healthy. I selected two half-trays and sat down for an hour equipped with tweezers and a small dibber. The results are shown for your interest. They have been fed with quarter-strength feed with trace elements and have put on some growth in the past six weeks. So now we come to the real test: how to manage them through the winter months? 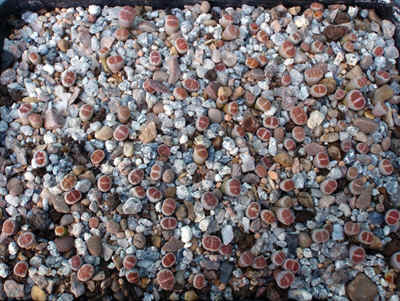 Lithops seedlings can be grown on through the winter into the next summer. Alternatively they can be rested so they form their new bodies as older plants do; however if they are too small they will dry up and not recover in the following season. If these had been sown this year I would keep them going through the winter. However these batches are in their second season and quite starved so my plan is to encourage them to grow as much as possible without becoming drawn or bloated and then rest them from around mid December onwards. 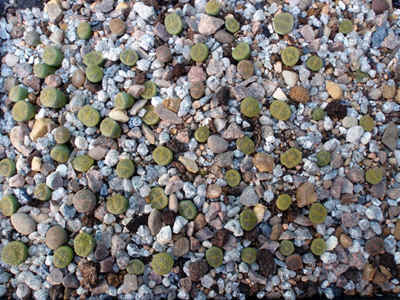 I maintain my greenhouse at around 8C minimum, but the Lithops trays are presently placed on a gravel bed with a soil warning cable underneath to keep them warm through the autumn. Time will tell if the investment proves successful! Below Left: Little Lithops karasmontana.